(MM-La Musica) Office MUVE dances relieve body and mind. Be more productive, shake off worries and loosen your body with Maggie and Rachel’s spontaneous dance exercises. Office MUVE is a series of dances recorded in a small office space. Rachel and Maggie take turns creating improvised dance moves inspired by the MOTIONS (MUVE Concept Cue Cards.) Follow only "loosely". Because the moves are being created spontaneously, there is no way to closely copy them - and that's not necessary. We want to invite you to dance in your own style, get the idea and try it in your own way. Motivate yourself to exercise because it's so much fun to do! Ride along with us and enjoy this fun dance exercise any time you need a break. Clear your head with a few minutes of easy dancing fun and gather new strength for the rest of your workday. 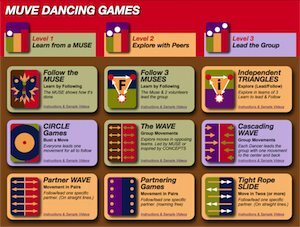 There are many other free dance along videos available at the MUVE Video Blog at http://www.muve.org. MUVE videos are easy cardio workouts that can be done by anyone young or old.